Indeed, Bill Gates, the multi-billionaire Chairman of Microsoft inc, was arrested for traffic infraction. He was pulled over and arrested for over speeding in his brand new 1979 Porsche 911. Oh, by the way, this event occurred in 1979, that was 4 years after Microsoft was founded. At the time, Microsoft was based in Albuquerque, New Mexico. 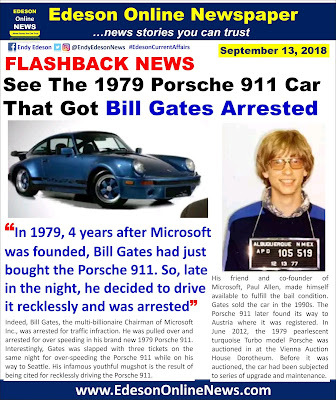 Gates had just bought the Porsche 911. So, late in the night, he decided to race it recklessly on the road of New Mexico. Interestingly, Gates was slapped with three tickets on the same night for over-speeding the Porsche 911 while on his way to Seattle. His infamous youthful mugshot is the result of being cited for recklessly driving the Porsche 911. His friend and co-founder of Microsoft, Paul Allen, made himself available to fulfill the bail condition. Gates sold the car in the 1990s. The Porsche 911 later found its way to Austria where it was registered. In June 2012, the 1979 pearlescent turquoise Turbo model Porsche was auctioned in at the Vienna Auction House Dorotheum. Before it was auctioned, the car had been subjected to series of upgrade and maintenance. The car was rebuilt to have a 3.3-liter air-cooled flat six engine, and it was repainted in the original colour of the car. The car was auctioned off for $80,000 in 2012. This news no help me at all. It is very irrelevant to me. Recklessness in our dear country tends to be a norm...but "they they" rush us go help us deliver them all.